Last week I whipped up amazing sugar free vegan brownies. My family and friends loved them. Then I received emails from some of you, lovely readers, saying that it was not fair to tease you so and not offer a gluten free option for this healthy dessert. I went back to the kitchen and worked hard, hoping that my gluten free experiment would not turn out to be an expensive flop. With a GF friend coming over for lunch that day, I felt even more pressured to perform. Thankfully my risk taking paid off–she and her toddler approved my gluten free brownies. I hope you will too. I am also adding an alternative to the raw almond frosting. 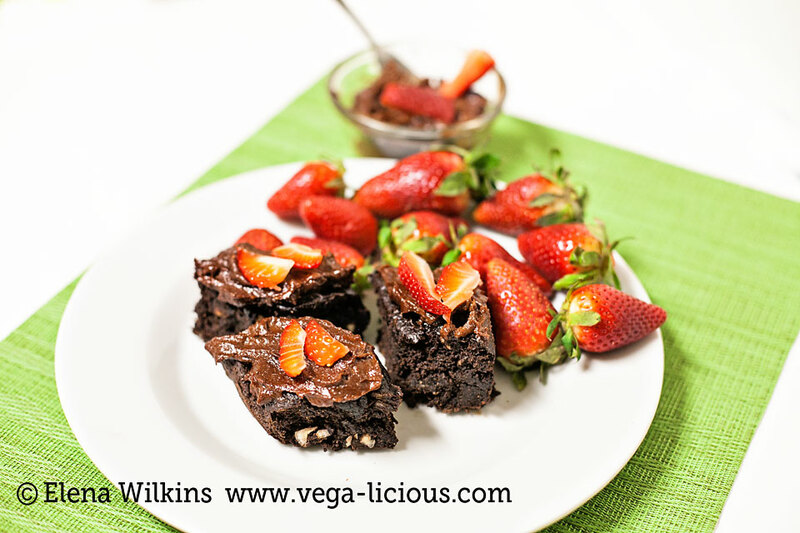 So, here comes a mouthful–you are getting a vegan, sugar, oil and gluten free brownies recipe. Blend these ingredients in a high speed blender (I used Blendtec with a Twister jar) into a very smooth paste. You will need 4-5 large strawberries for garnish. Line a 9×9 or 10×10 (inch) baking dish with parchment paper and pour brownie mixture into it, spreading evenly. After 25 minutes take out and insert a toothpick in the middle and on the edges–if it comes out dry, brownies are done. If the toothpick is not fully dry, bake brownies for additional 2-3 minutes. When brownies have cooled, spread Raw Chocolate Walnut Fondue over brownies (you can also use the Raw Chocolate Almond Frosting), and cut into 2-3 inch diamonds. 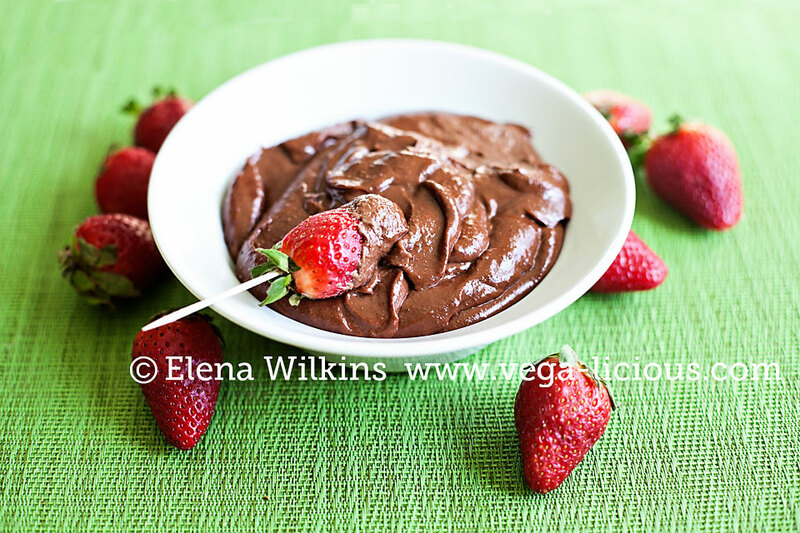 You can enjoy this fondue as an occasional treat over brownies, or even for strawberry dipping. It makes for a decadent treat! Sprout calls it CHOCOWATE and cannot get enough of it. 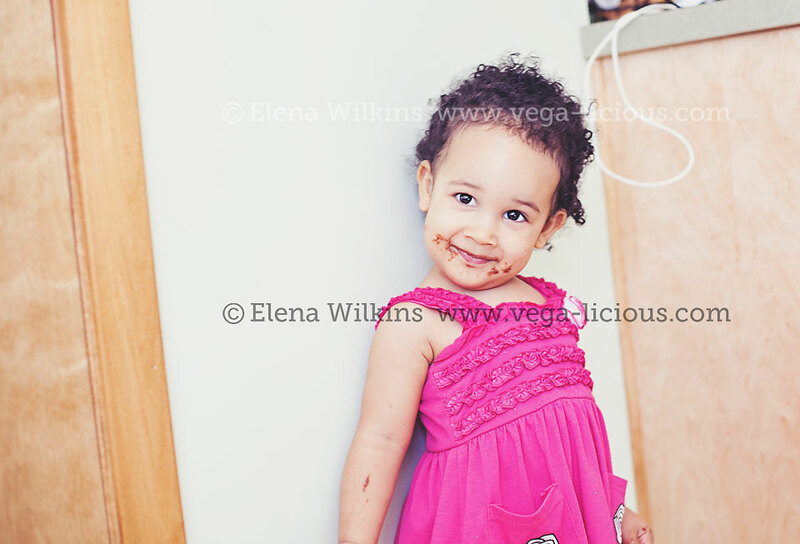 I do limit how much she can eat of it due to the raw cocoa content. Once you make either of these recipes, leave a comment with a picture–I would love to see your creations! Share this vegan, sugar and gluten free brownies recipe with others–pin it, twit, Facebook and email it. Share this healthy brownie recipe with the world.